What could be a better example of ‘orange’ than my youngest son Will, who is 10? Orange hair and orange freckles! 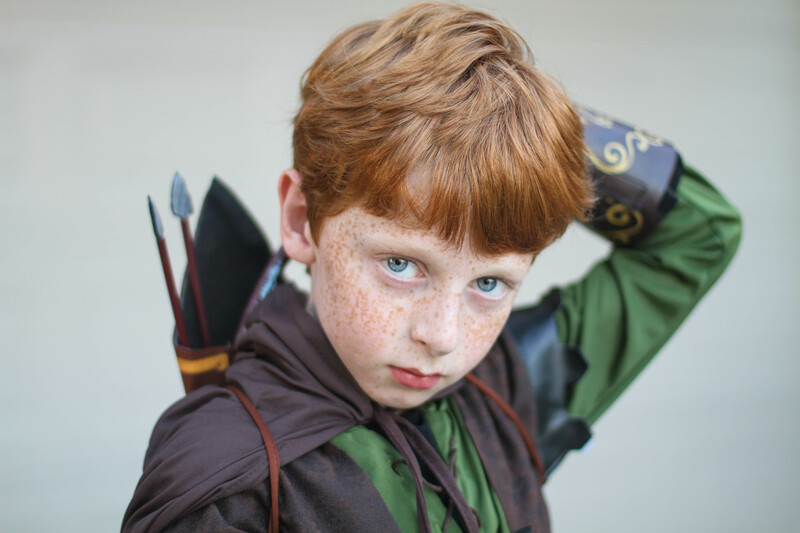 He wanted to be Legolas for Halloween this year but we struggled to find a costume. So he is a Legolas/Elf/Robin Hood hybrid. He loves to dress up and get in character and so he is fabulous to take photos of! I love taking pictures in the ‘golden hour’, and as I’m not a morning person for me this is ideally not the hour after sunrise, but instead the hour before sunset. The light is fantastic for taking photos. There are many Golden Hour calculators to help you pinpoint when this time of day is. I used http://www.golden-hour.com yesterday and it told me that the best time to take photos would be during the hour starting at 6.01pm. So this picture of Will is taken at about 6:15pm, the sun has just dipped down behind our house and Will is standing in front of the garage. He is a few feet in front of it so I would get great depth of field and blur out the background. This is why you don’t see the square shapes on the metal garage door. The camera I shoot with is a Canon 7D and I was using my Canon 50mm 1.4 lens. As it was still so light, my ISO was set at 125, and my shutter speed was 1/200. Aperture was at it’s widest for this lens, f/1.4, to get background blur. I like to make any edits to my images in Lightroom 4. I made very slight adjustments, increasing the contrast, clarity, vibrance, saturation, and sharpening. Finally, I used a preset ‘eye sparkle’ brush that I purchased a while ago from Pretty Presets for Lightroom, and enhanced his gorgeous blue irises. So here is a photo of “orange”. A beautiful sugar maple in Delaware Park in the heart of Buffalo, NY. Taken while dodging the lingering rain showers left by “Sandy” on a very overcast day. 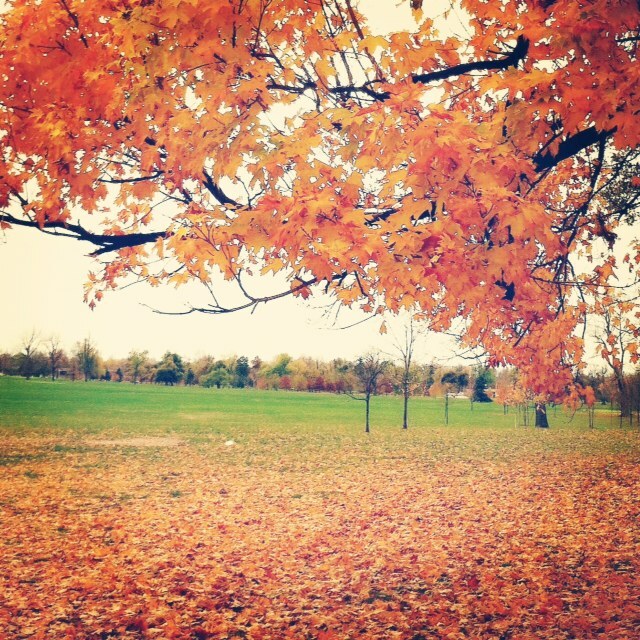 As mentioned in our opening post, all my photos on this blog will be taken with my iphone 4. In addition, all photos will be edited exclusively on my phone. So, for this photo, what did I edit with? Snapseed, for cropping, brightening (very much needed on this gloomy day)and sharpening (so the leaves would “pop”). Then, Camera 360 and Instagram for effect. As much as I love “snapping” life as it happens around me, I especially love the editing process and creating my own little work of art. Wow….very nice, both of you. I like both pics but for very different reasons. Good thing this isn’t a contest or I’d be hard pressed to choose a winner. Love both of your photos girls! Great job! Love both pictures ladies…. Fabulous! I love the new blog! Can’t wait to see all your pictures…. You are both so talented! I love the idea. Looking forward to reading about the inspiration, behind the photos. Yay! Can’t wait to see what this photo challenge brings!!! Love this idea ladies!! Great pics! Can’t wait to see more & learn more…you both are so talented!